RV Camping at Rohr's Wilderness Tours Camp on our spacious campsites and enjoy the beauty,serenity,hiking,canoeing and kayaking. Spacious 20/30/50 Full Hook-up Sites, complete with eight pullthrough sites for a total of fourteen for all the electric sites! Seasonal Sites are now available and going fast - make your plans today! Bring your RV or Camper and stay with Rohr's Wilderness Tours - Do you like to camp at State and National Parks,then check us out! RWT's spacious campground is in beautiful woods with sites spreadout through our gorgeous forty acre woods with rolling hills and borders the beautiful and wild Headwaters of the Wisconsin River and Portage Creek. RWT is located in the center of Vilas County, 13 miles north of Eagle River,with surrounding towns of Sayner, St. Germaine, Three Lakes, Phelps, Boulder Junction, Star Lake, Land o' Lakes and the Upper Pennisula of Michigan all within easy reach. Vilas County offers many festivals, lakes and attractions to see. We have our own private canoe landing on the Headwaters of the Wisconsin River, and can outfit you for a great paddle. Bring your bikes and enjoy the many trails in the area and are very own mountain bike and hiking trail on property, Have you ever enjoyed wild berries? Well you will, if come during our berry season from mid to late summer. You will enjoy the wild blueberries and raspberries here for our campers to pick, best of equipment to rent for canoeing and kayaking, large pavillion, camp supplies, a dumpstation, and a fabulous shower house for that great shower at the end of the day. Are you an equestrian camper - come on in, we have a place for you and many miles of trails for you to to ride. Want to bring your ATV/UTV to the the northwoods, come on in, we're located on one of the Conover ATV routes,and are only a short ride away from the UP of Michigan. Ride from your campsite and forget about trailering for the rest of your stay! Our full hook-up section and our Tent section, Blueberry Haven, are being called great by our campers. The RV sites have 20/30/50 amp hookups with eight pull thru sites and all have water, electric and sewer. 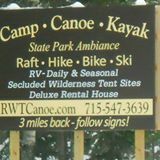 These sites are available for Seasonal Rental, make your getaway home in the Northwoods here at RWT. Just bring your camper, set up for the season and be here all you want without having to do all the work of a second home each time, instead you get to play. Our water/electric sites are large enough for the biggest rigs. All the sites are wooded and have a fire pit and picnic table. No need to backup your trailer if you don't want to - we have a circle drive and six pull-thru sites in the water/electric section! RVs and camping trailers with bathroom facilites are not permitted to be on tent camping sites. The use of generators is not permitted anywhere on the property. 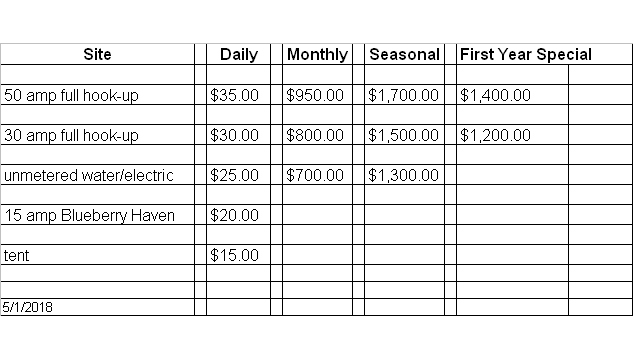 Seasonal sites available, please call for availability, reservations are open. Reservations for non-seasonal sites open May 15. Opening may be delayed by late snow and frost to ensure that the campground and roads will not be torn up during the time of melting. Also late frost will delay the campground water from being turned on due to potential freezing. The campground will remain open until the stated end date but campers may have to disconnect from hydrants overnight if temperatures are falling close to or below freezing to prevent damage to the system. The shower house will close when temperatures get close to freezing to prevent damage. Each campsite is complete with picnic table and firepit. All camping guests have access to our wonderful showerhouse, which is open 24 hours. Nestle yourself in the northwoods and enjoy the tranquility, and fun that RWT offers. Now if you like to pick wild berry's this is the place for you. You can pick wild blueberry's from most of our campsites with acres more to enjoy. RWT also has delicious rasberries,black berries and hazzel nuts. Ice and Firewood are available at our office. Per State of Wisconsin DNR regulations no firewood may be brought into Wisconsin from out of state, this is due to an infestation problem which attacks ash trees. Join us on Facebook and Yelp, become a friend and follower.